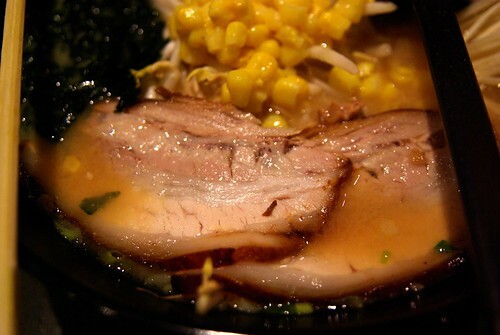 A new ramen restaurant opened in Chinatown last week, following in the footsteps of Ramen-Ya (also on St-Laurent, but just a couple of kms north). 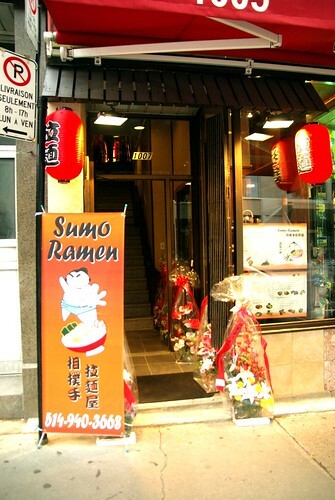 The name of the restaurant is Sumo Ramen and took place in what used to be a skate shop. 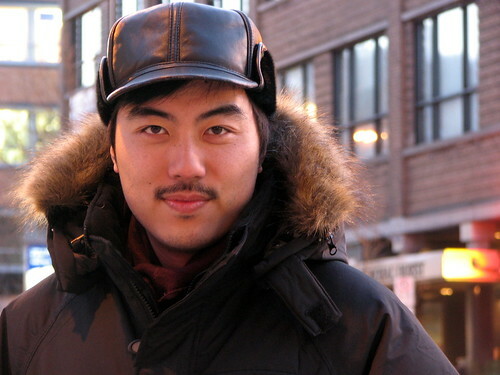 One of the owners is Anthony, a stylish Cantonese-speaking 30-something. He originally rented the space, and for siz months, did not know what to do with it. 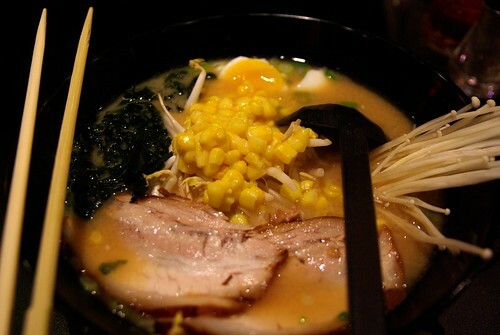 When his friend came back from living in Japan for several years, they decided together to start ther ramen business. The friend who I went with said that the place reminded him of what restaurants in Asia look like, a far cry from stuck-in-60s Chinese restaurant of the old Chinatown. 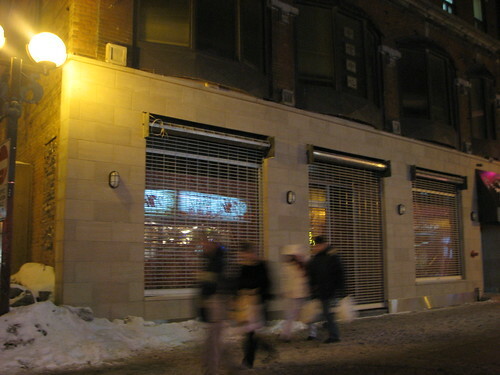 2008-09 has seen the arrival of an impressive number of new restaurants in Chintown, one trendier than the other. It started with Little Sheep and things moved on with Hanashima (a Japanese-style fondue restaurant), and two new bakeries, Harmonie and Callia. 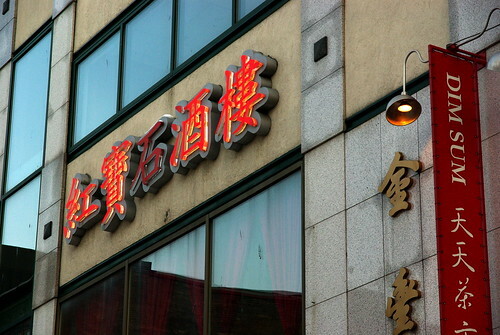 I also saw a Sichuan-style restaurant and another "spicy" joint. Je fais une courte apparition demain jeudi vers 13:45 EDT, sur l'émission en français de Radio-Canada International, pour parler de mon blogue et ce que c'est d'être chinois-canadien à Montréal. 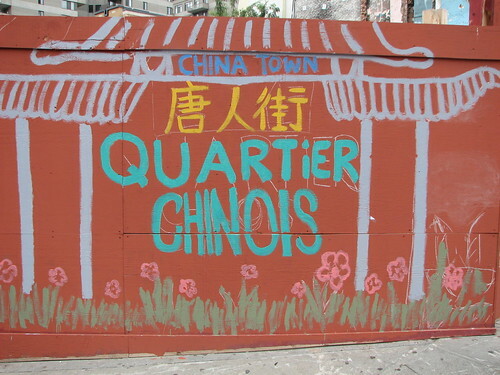 Tomorrow, Thursday, I am making a short appearance at around 1:45 PM EDT, on RCI's French-language show, to talk about my blog and what it is to be Chinese-Canadian in Montreal. This Saturday, June 7th, for the entire day, special activities will be held in Chinatown in memory of the victims of the earthquake that shook the Chinese province of Sichuan. The walk will start in Sun Yat-sen park shortly before 4PM, and will march on Boulevard René-Lévesque, up to McGill Street, and then head back to Chinatown through Old Montreal. 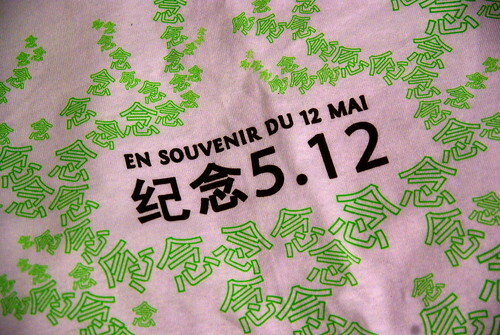 A commemoration will then happen in the evening from 7PM to 9PM at Sun Yat-sen Park. Toute la journée, ce samedi 7 juin, auront lieu au Quartier Chinois de Montréal des activités spéciales à la mémoire des victimes du séisme qui secoua la province chinoise du Sichuan, le mois dernier. Le groupe de marcheurs quittera le Parc Sun Yat-sen peu avant 16h, pour se diriger sur le Boulevard René-Lévesque, jusqu'à la Rue McGill, en revenant par le Vieux-Montréal vers le Quartier Chinois. Une commémoration se déroulera ensuite en soirée, de 19h à 21h au Parc Sun Yat-sen. 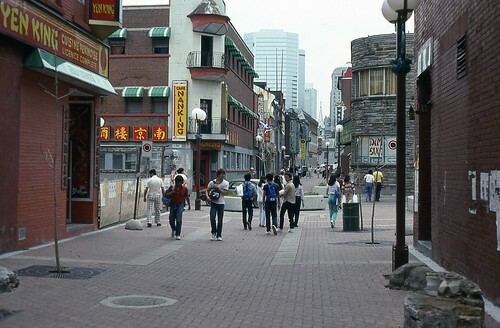 Went to Chinatown after work yesterday to do my groceries, and took pictures of businesses over there. Last Friday, I published an interview with Yung Chang on Comme les Chinois, whose documentary movie Up the Yangtze, following the lives of people whose home was flooded by the Three Gorges Dam project, came out at the AMC. The French version of the film comes out at Quartier Latin this coming Friday. It was a very relax interview, even if it was the first interviewee in the news on the same week that I was doing. I did not know Yung beforehand, except for bumping into him at the Nouveau Cinema festival, where his film premiered. We then realized that we had a bunch of acquaintances/friends in common... Perhaps the circle of artistically-inclined CBCs of a certain age is really small? We talked a lot about food, or lack of real good Chinese food in Montreal... And then there was the obligatory questions about the film. While perhaps running the risk of sounding too all over the place, I chose not to ask the obvious questions already heard on The Hour and all of Montreal's free weeklies. I find random, boring questions almost more interesting. Like I was discussing with a previous guest, they always seem to let you discover new things about your guests. When interviewing people for a short-lived weekly student newspaper (because it was during the last semester of cegep - and that was almost 10 years ago), I thought that interviews always certainly allowed for something new to come out of the interaction between two people, the interviewer and his guest. It is maybe the starting point for awesome ideas like L'autre midi à la table d'à côté, a special radio feature on Radio-Canada's La Première Chaîne. Steve Faguy wrote a short article about my new blog Comme les Chinois in this morning's Montreal Gazette Saturday Extra section. A new building revealed itself to dwellers of Montreal's Chinatown over the past week, on the corner of De La Gauchetière and St-Urbain, where a Chinese emporium and post office once had pignon sur rue. It had been hidden behind wooden planks for about a year, or perhaps more, with no signs of what was being developed. 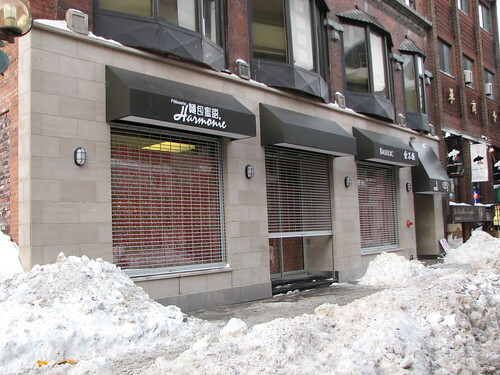 The second floor of the building is occupied by the Montreal Chinese Chamber of Commerce, while a side door adorning a renewed sign also leads to some Chinese Christian organization. We speculated that it could look like a bank, but is not plausible since all major Canadian banks (and HSBC) have locations within a block or two from there. A clothing store would be neat, but to whom would it cater? If it were a restaurant or eatery of some sort, wouldn't they be hiring personnel weeks before opening, as it was the case with Xiao Fei Yang in February 2007? Or, a simpler explanation, it could well be just the former owners of the Chinese emporium expanding to larger and newer premises. 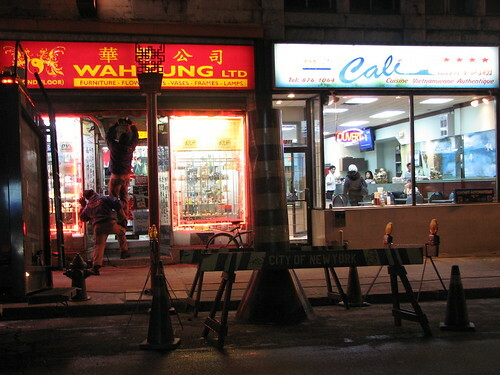 Upon reading Chris' article about Montreal Chinatown's sudden metamorphosis for a movie called "Baja" (say the signs, but Chris mentions it is something called "The Punisher" instead), I was obliged to go take a look for myself. Indeed, the change is very amusing, as most store names remained the same, except for a brand new dim sum place called "Imperial". It was like an alternate reality where Quebec language laws did not exist! At the corner of the virtual Eldridge & Grand (De la Gauchetière & St-Laurent) stood a newsstand typical of New York City. It turns out that one of my favourite eats in NYC, one random dirt-cheap dumplings house, is within a block of the real Eldridge and Grand. They also shot at Église St-Pierre-Apôtre, corner of La Visitation and René-Lévesque, shining huge projector lights into the church's stained glass windows. Qui? Ouvert à tous, bien sûr. Organisé par le groupe multiculturel du SFCGM. Who? Open to everyone. Organized by the CFSGM multicultural group. A NFB documentary by Yung Chang, 2003, 41 minutes. Edit (2008-07-14): Last week, I tried bringing my friends to Restaurant Congee, just to find that it has closed for good, it seems! Just after a few months of existence - quel dommage! Edit (2008-02-03): 豐衣粥食 is actually the Chinese name of this place. After the singing contest last week, we got a bunch of cards for free dessert at this congee restaurant in Brossard. The name in Chinese is perhaps a little more meaningful, evocative, but I cannot read it. My mother said that she saw ads for this particular restaurant in Toronto - so we might assume that it is part of some pan-Canadian chain. So, yes, there is a congee place in Montreal, and it is in the suburb of Brossard, where a fairly large Chinese/Asian community lives. The menu indicates countless possibilities of congee combinations, more than I've ever seen in Chinatown for the very least. The said congee restaurant might be in a boring strip mall, but the interior of it is certainly not bad, with its redwood and clean environment (we thought it might've opened recently, as the strip mall sign does not include them yet). Continue reading Restaurant Congee (豐衣粥食) in Brossard. The Robitussin was perhaps Extra Strength, but is a lot more potent. 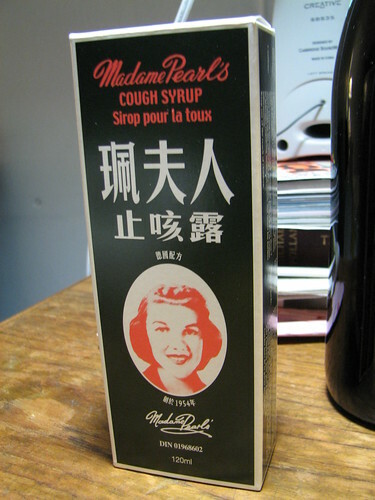 Price-wise, the Madame Pearl's was 5$ for 120 ml and I forgot how much the Robitussin was, but probably around $8-10 for 100 ml. 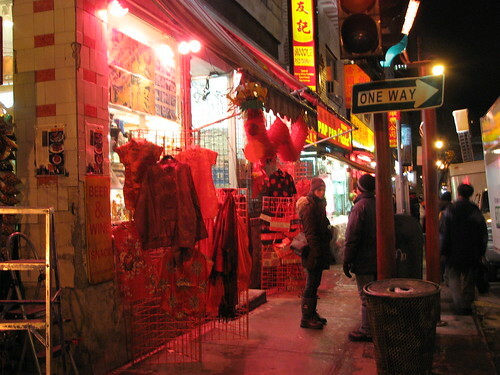 This page is a archive of recent entries in the Chinatown category. China 2008 is the previous category.